2 salmon fillets, skin removed. 2. To prepare the salmon, lay 2 slices of prosciutto side by side length ways slightly overlapping. 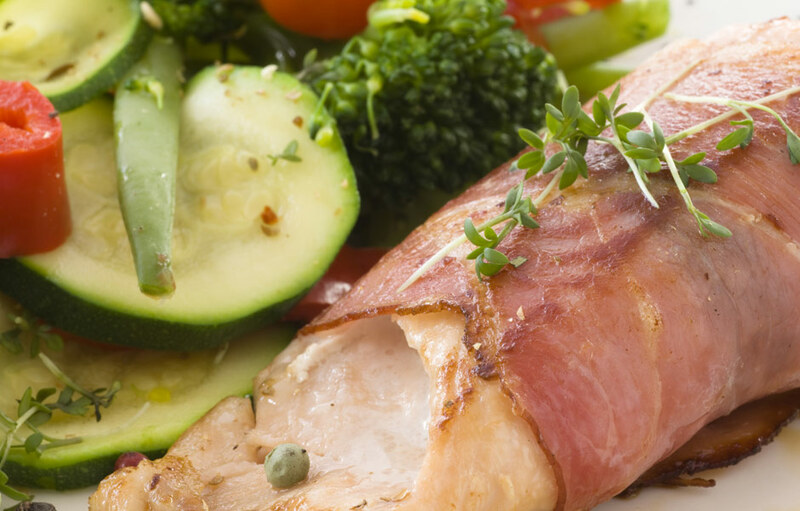 Place the salmon fillet at one end and gently roll tucking the prosciutto around the filet. Prepare the second filet in the same manner. Lay a thyme spring on top of each fillet and drizzle with olive oil. 5. Cook the salmon fillets in the oven for 10-12 minutes until cooked through. 6. While the salmon and potatoes are cooking prepare and gently steam a serving of broccoli florets until tender. 7. Once the sweet potatoes are softened remove from the heat, drain any excess water. Lightly mash with a fork leaving a slight rough texture. Add 1 tbsp Greek yoghurt and gently mix through. Set aside keeping warm. 8. Remove the salmon from the oven and serve onto warmed plates. Add a serving of sweet potato to each plate and sprinkle with pomegranate seeds and a portion of broccoli.